Background: Nowadays, malaria is still one of the most important and lethal diseases worldwide, causing 445,000 deaths in a year. Due to the actual treatment resistance, there is an emergency to find new drugs. Objective: The aim of this work was to find potential inhibitors of phosphoglycerate mutase 1 from P. falciparum. 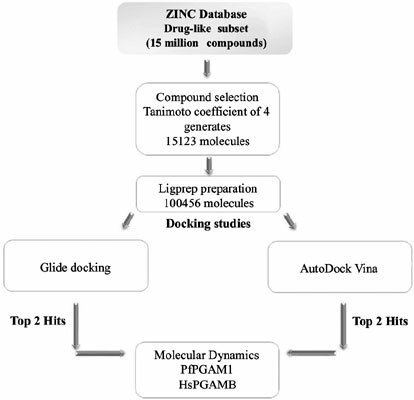 Results: Through virtual screening of a chemical library of 15,123 small molecules, analyzed by two programs, four potential inhibitors of phosphoglycerate mutase 1 from P. falciparum were found: ZINC64219552, ZINC39095354, ZINC04593310, and ZINC04343691; their binding energies in SP mode were -7.3, -7.41, -7.4, and -7.18 kcal/mol respectively. Molecular dynamic analysis revealed that these molecules interact with residues important for enzyme catalysis and molecule ZINC04343691 provoked the highest structural changes. Physiochemical and toxicological profiles evaluation of these inhibitors with ADME-Tox method suggested that they can be considered as potential drugs. Furthermore, analysis of human PGAM-B suggested that these molecules could be selective for the parasitic enzyme. Conclusion: The compounds reported here are the first selective potential inhibitors of phosphoglycerate mutase 1 from P. falciparum, and can serve as a starting point in the search of a new chemotherapy against malaria. Keywords: Malaria, Plasmodium falciparum, Phosphoglycerate mutase 1, Virtual screening, Molecular dynamics, ADME-Tox. Keywords:Malaria, Plasmodium falciparum, Phosphoglycerate mutase 1, Virtual screening, Molecular dynamics, ADME-Tox. Abstract:Background: Nowadays, malaria is still one of the most important and lethal diseases worldwide, causing 445,000 deaths in a year. Due to the actual treatment resistance, there is an emergency to find new drugs.